The Sawtooth National Recreation Area, located just north of Sun Valley, is well known for the fantastic scenic beauty and the recreational opportunities that it possesses. 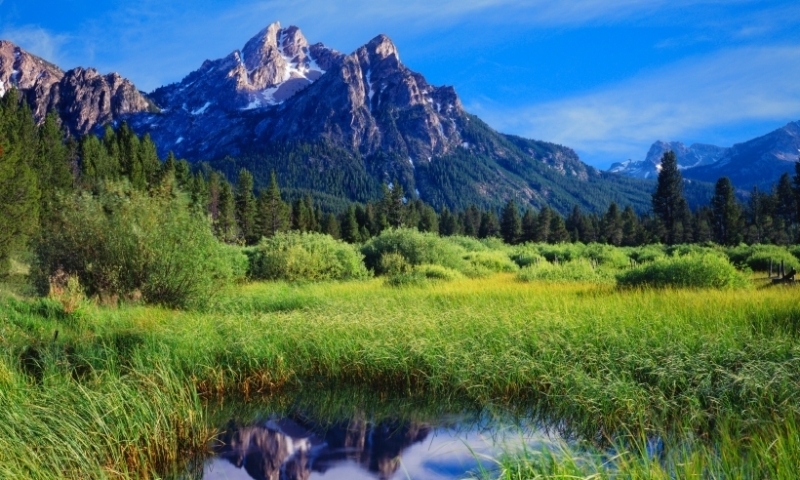 The 756,000 acre Sawtooth National Recreation Area (SNRA) in Idaho was created by the United States Congress in 1972. This Recreation Area is similar to a national park, although there are more uses allowed, such as hunting and some limited timber harvest – activities which are not allowed in national parks. The area is considered to be public land and is managed by a special division of the Department of the Sawtooth National Forest. The most noted feature in the Sawtooth Wilderness is that there are no motorized vehicles, no motors of any kind, no logging, no buildings, and absolutely no roads are allowed in the area. The SNRA lies between two rugged mountain ranges, the White Cloud Mountain and part of the Boulder Mountains. The area also includes a portion of the Smoky Mountains and the headwaters of the Big Wood River. The major rivers that have their headwaters originating in the SNRA are the Salmon River, the Payette River, the Boise River and the Big Wood River. The SNRA headquarters are about eight miles north of Ketchum on Highway 75, and the SNRA also has a ranger station in Stanley, near its northern boundary. Activities within the roughly 778,000-acre recreation area include hiking, backpacking, White water rafting, camping, rock climbing, kayaking, mountain biking, fishing, and hunting. This area is massive and as you would expect, there are many camping areas, both development and primitive sites to choose form. For those who like to travel in an RV, there are many RV compatible campgrounds complete with hook-ups and pump stations. Hours, fees and various restrictions vary from campground to campground. For detailed information contact the local Forest Service office directly or contact the National Recreation Reservation Service (NRRS) by phone at 1-877-444-6777 or TDD 1-877-833-6777. No motorized vehicles are allowed in the wilderness portions of the SNRA. There are trails everywhere, and often the best way to experience the backcountry is by trail – either by foot or on horseback. Before you go, contact the local Forest Service office for maps and regulations. If you are riding horses, they can supply you with the information needed to include campsites with stock facilities, any permits needed, campfire restrictions, party size limitation, available grazing sites, trail conditions, area closures, and more. There are over 300 lakes in the SNRA. The headwaters of the Salmon River, the Payette River, the Boise River and the Big Wood River are also located here. These waters are the home to native trout and salmon. State fishing licenses are required and can be obtained from a local state fish and game office or sporting goods store. You can obtain a copy of the state regulations that cover these points at the time you get your license.